I’ve met with a bunch of the vendors at Macworld | iWorld who are touting tools they say will make iPads and iPhones better business tools. Two in particular have stood out so far. 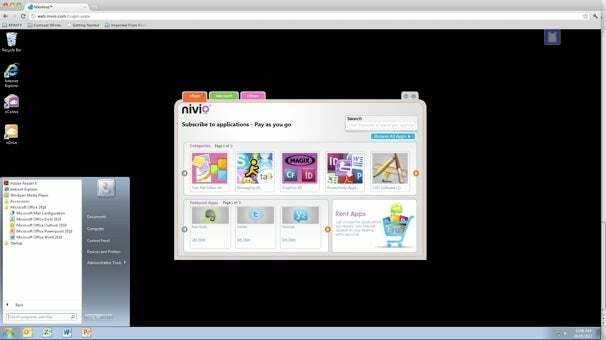 The first is a newly launched service called nivio. It lets you log in to a fully functional Windows desktop (specifically, Windows Server 2008 with the Aero theme) from an iPad or iPhone (or Mac or Android device), using any HTML5-compatible browser. (An iOS app is forthcoming.) Once you’ve logged in, you can use Windows applications and store files online, just as you would on a real Windows machine. So if you work in a Windows-centric company, you could still use your iPad for business. The general outline of what nivio does isn’t unique; other vendors, such as OnLive Desktop, do something similar. But nivio adds some interesting twists. The service is in beta testing now (you can register at nivio.com), with a target launch date of February 14. There’s a special launch promotion for beta testers: up to 10 hours of use for $5 per month, or $15 a month for unlimited access. That fee covers access to the service and 10GB of storage; you pay rental fees for apps on top of that. Students get sharp discounts. The second company is Soonr. The company has been around since 2005, focusing on online storage and file-sharing for businesses. (It added Mac-support last year.) None of that is particularly special. But the iOS app they’re showing at Macworld | iWorld, Scribble, could be. Scribble ($4, universal) lets you highlight, mark up, and otherwise annotate files in 35 different formats, including PDFs, of course, but also Excel spreadsheets, Word documents, and files from Adobe’s Creative Suite. Those files must be stored on Soonr’s servers, which means you can collaboratively annotate them with colleagues; everyone's comments and markings are synced back to the original document in the cloud. If you’re offline, you can still mark up documents; your changes will be synced back to those files the next time you connect. Scribble is just one piece of a larger Soonr ecosystem: Soonr’s core file-storage service is specifically designed with teams in mind: You can create project folders that are accessible to collaborators. And there's another companion app, Soonr Workplace, that lets you edit some of those online documents—Excel sheets and PowerPoint slides in particular—from your iPad or iPhone, too. Soonr’s Premium plan costs $10 a month for three users and 25GB of storage; you also get the ability to provide ad hoc file access to two other users at a time. (Soonr calls such ad hoc users “connections.”) The Pro plan is $30 a month, which gets you 100GB of storage, access for five users and 20 connections. Customized plans are also available.